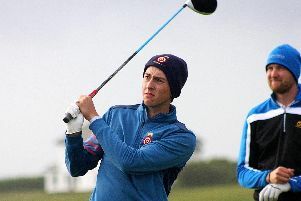 Harry Ellis insists he won’t be starstruck as he attempts to become just the third amateur champion in 19 years to make the cut in the Masters. The Meon Valley Golf Club ace starts his debut charge for the Green Jacket tomorrow (2.25pm BST). He’s been paired alongside 1998 champion Mark O’Meara and Brian Harman, who was tied second in the US Open last year. Ellis will then tee off for his second round at 5.10pm on Friday. The 22-year-old booked his place at Augusta by winning the British Amateur Championship last June, which also earned him a spot in the Open at Royal Birkdale the following month and a berth in this year’s US Open. Since reigning champion Sergio Garcia finished in a tie for 38th in 1999, Italy’s Matteo Manassero and France’s Romain Langasque are the only other amateur champions to play all four rounds at Augusta. But having played the course several times already during his final year of competing for Florida State University, Ellis is optimistic he can buck that trend. He said: ‘I’ve seen very few amateurs have done well here over the years. It usually takes that period of time to get to know the course, but I believe in my ability and I think I can definitely play well here. ‘I’ve made three or four visits now and especially this week I’ve tried to get a feeling for certain areas to hit it and the right shots to hit. ‘You can see why veterans play well because every time you turn up you are always learning something new about it. ‘I’ll try to learn from those players but it’s important not to overdo it, not to get starstruck by the players. ‘You are still a member of the field so it’s important to find the right balance. Ellis is likely to turn professional after the US Open at Shinnecock Hills in July. But in the meantime, he is intent on making the most of his second Major appearance. ‘The ultimate as a golfer I would say is to be a part of the Masters field,’ Ellis added. ‘When that invite comes through you’ve seen people take pictures of theirs in years past and for your name to be on it is something I will always cherish. ‘It’s such a special tournament and that’s a word I keep using but it really is.